"The Origami of Valerie Vann"
That amazing! how many pieces did take? The flower needs 6 sheets - 3 for the leaves, 3 for the bloom. I LOVE IT SOOOOOO MUCH!!! I WOULD PAY ANY PRICE 4 IT!!!! okay so first of all its not your rose, or your picture, or your web!!!! so what do you care, you only come to insult along with the other message. she can make it how ever she/he wants and it is not your business!!!!!!!!!!!!!!!!!! The image above is not a "nicer" image of it. I have seen many pictures of it, and the one above is not a good picture. I made one myself, and it looked better than that! The rose is awesome. 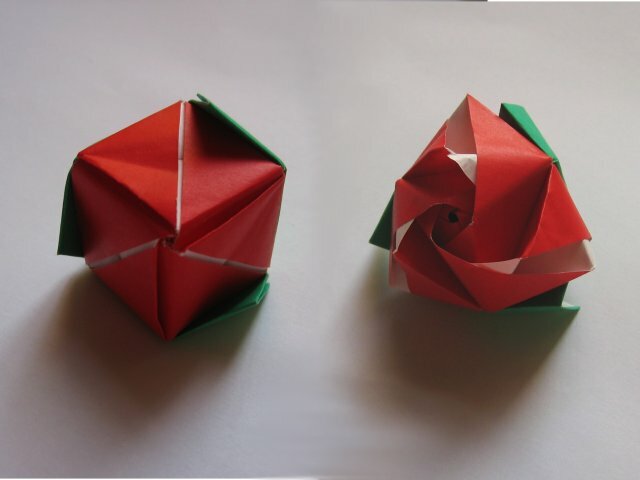 You can switch from box to rose really quickly, but beware that it may be difficult, when you connect them they may be loose and fall apart, making me get another 6 post-it-notes and refolding them, and reassembling them. sometimes,scratch that, ALL the times im amazed at how creative people are when making origmi, and im amazed when people recreate amzing masterpieces like this! TRULY amazing!! !